Sunny to partly cloudy. High 66F. Winds N at 10 to 15 mph..
Mostly clear. Low 38F. Winds E at 5 to 10 mph. 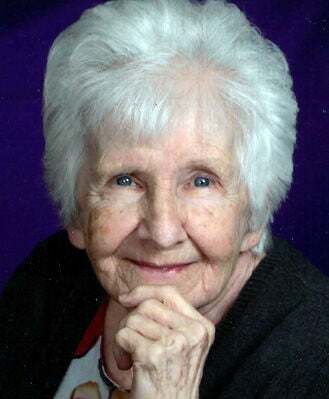 HAZEN — Betty Krause, 88, Hazen, passed away peacefully on Nov. 16, 2015, at Knife River Care Center, Beulah. Her wishes for cremation have taken place. A celebration of her life and funeral mass will be held at 10 a.m. CST Saturday, Dec. 5, at St. Martin Catholic Church, Hazen. A rosary service will be held at 6:30 p.m. Friday at the church, with a vigil service to follow at 7 p.m.
Betty Lou Retterath was born Sept. 24, 1927, in Bismarck, to Norbert and Freda (Schmidt) Retterath. She was the second of six children and grew up on the family farm. Betty attended the Pleasant Valley Country School and graduated from Hazen High School in 1945. Betty married Wilbert J. Krause on Sept. 11, 1946, at St. Martin Catholic Church in Hazen and together, they raised a family of six children. They owned several local businesses, including Box’s Bar, Hazen Hotel, Krause’s Korral and Willie’s Bar and Steak House. Betty was a working business partner, full-time mother and housewife. Betty was well known for growing beautiful roses in the front of her home and designing decorated eggs. She excelled in creating knitted afghans and crafts. She loved to garden and was an outstanding cook and baker, specializing in lebkuchen cookies and fleischkeukle. Betty was regarded as the best grandma ever. Betty is survived by her children, Mike (Bonnie) Krause, Hazen, Tim (Jan) Krause, St. Cloud, Minn., Mary McNamee, Harrisburg, Pa., Liz Krause (Steve Meadows), Hazen, Ted (Tammy) Krause, Hazen, and Kip Krause, Palm Springs, Calif.; her grandchildren, Kris Krause, Susan (Chad Drath), Holly (Rick) Senn, Josh Krause, Beau (Lizzie) McNamee, Kyle (Carrie) McNamee, Sayward (Brian) Sorge, Ty (Holly) Victor, Cameron Victor, Derek Krause, Danielle Krause, Christopher Krause, Devon Krause and Will Krause; 11 great-grandchildren; and her sisters, Rosemary Nesper, Bismarck, Patty (Allen) Sailer, Huntsville, Texas, and Bonnie (Robert) Ford, Bismarck. Hobby Lobby - 4 col x 12"
Rivers Edge Plumbing & Heating Inc.
Westley's Jewelry wants to help turn your unique jewelry dreams into beautiful realities! Stop by today with your design ideas to get started!